Burritos may seem like a dime a dozen in this city—the same place the filled-to-the-gills, bursting-at-its-seems Mission-style burrito came to fruition—but once you find your favorite you'll know: not all burritos are created equally. Whether you love them extra juicy, with rice or without, or packed with chunks of avocado, salsa, and sour cream, San Francisco has just what you're looking for...and then some. 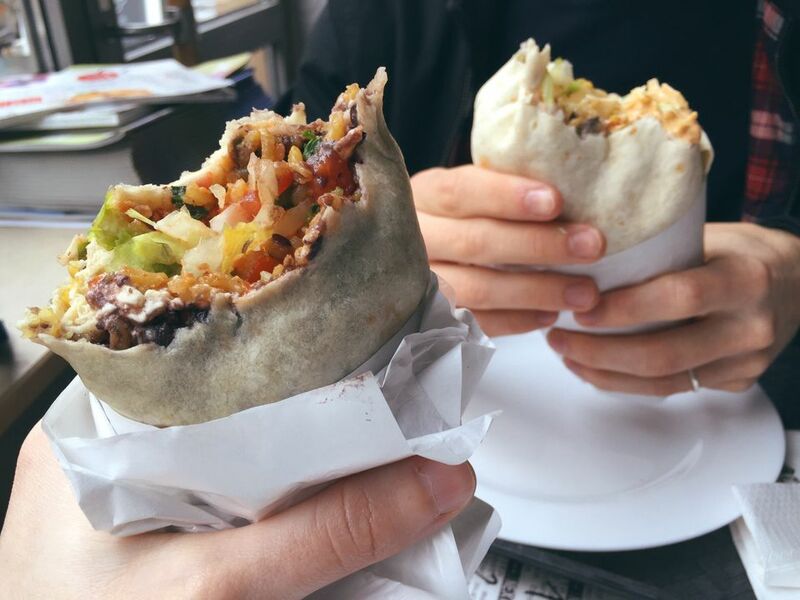 Make a note: consuming a super burrito with all its fine goodness too quickly might just take you out of commission (though leave you thoroughly satisfied) for the night. Eat responsibly. Voted “Best Burrito in America” by opinion poll generator FiveThirtyEight, La Taqueria is a local institution, albeit one that may have to relocate if the sale of its building goes through. For now, the beloved taqueria remains in the heart of the Mission, and still hosts lines out the door for its famous burritos: rice-free and insanely delicious, especially the carne asada burrito, grilled to a subtly crisp perfection and filled with who refried or pinto beans, pico de gallo, and plenty of meat. Especially popular with the late-night crowd, Taqueria Cancun whips up a super burrito that bursting with goodness—saucy beans, ripe avocado, ample rice, and cilantro—enough to soak up any after-effects from too much partying. The bright yellow space offers a pleasant environment for chowing down, though the eatery's close enough that you can take your burrito to go and be people-watching in Dolores Park in minutes. Tucked away in a residential park of San Francisco's NOPA neighborhood, Green Chile Kitchen specializes in cuisine that's distinctly New Mexican, including a chile relleno burrito stuffed with beans, rice, pico de gallo, and your choice of meat, then tossed on the grill before serving. It's a welcoming space, with lots of windows and communal seating, and a local feel. Save your receipt and use it at Green Chile Pies—one block south—for 15% off dessert. Another San Francisco favorite with multiple Mission District locations, El Farolito is known for its finely-tuned beans-to-rice ratio, and for doling out just the right amount of sour cream. It's a hole-in-the-wall late-night haunt that packs in the crowds after midnight, who come hungry for items like the Super Shrimp and Meat Burrito, bursting at the seams with cheese, rice, beans, avo, salsa, and sour cream. A second best burrito winner, according to multiple SF Weekly reader polls, Papalote scores accolades for its salsa, a secret recipe that even helped beat the taqueria in a throw-down with TV host and American Celebrity Chef Bobby Flay. It lends an extra juiciness to the burritos, which come in your choice of flour, whole wheat, spinach, or roma tomato tortillas, as well as tortilla-free. Although Taqueria Los Coyotes offers a fine selection of San Francisco's famously overstuffed Mission-style burrito, the big seller here is its California burrito, a 1980s invention that utilizes french fries as one of its main ingredients, along with streak, cheese, avocado, and sour cream. It's a no-frills burrito joint. Simply order at the counter, wait for the cashier to call your number, and then get noshing! One of the grandfathers of San Francisco's glowing food truck movement, Senor Sisig is hailed for its “Filipino fusion flavor,” a coming together of Mexican and Asian cuisine that results in burritos oozing with tasty and aromatic goodness, including adobe garlic rice and creamy cilantro. Follow their Twitter feed or check their website to find out where they'll be dishing out next. Queue up, place your order, then enjoy the assembly-line creations of Mission-style burritos bursting with fresh ingredients. While Pancho Villa draws crowds both day and night, space seems to open up quick. Be sure and have an extra dollar or two ready for the roaming Mariachi musicians who come through on weekends, then sit back and enjoy the authentic Mexican ambiance. This cozy artisanal taqueria along Divisadero Street in the Lower Haight (and with additional locations in Noe Valley and the Mission) serves up a fine selection of innovative burrito offerings, including a delicious Fried Plantain & Black Bean Burrito with smoky chile salsa and the decadent Al Pastor Burrito, complete with al pastor pork, sautéed onions, poblanos & grilled pineapple salsa. If you're feeling a little extra frisky, opt for one of the smothered burrito options—a healthy topping of green chile or red guajilo sauce—for a small extra fee. Known as one of the birthplaces of the Mission-style burrito (it was here that Mexican immigrants Raul and Michaela first created the iconic “assembly-line style”), Taqueria La Cumbre celebrated 50 years in the Mission in 2017. It's a legendary establishment, attracting a notable fanbase with its multiple burrito sizes, vegetarian and seafood options (ranging from falafel to fresh fish burritos), and tortilla varieties. Friendly service, a jovial atmosphere, and straightforward burrito options all in a convenient Haight-Ashbury locale. The eatery boasts a diverse meat selection that includes nopales (cactus), camarónes (grilled shrimp), and alambres (chicken or beef with peppers and cheese), and its popular Street Burrito comes filled with double the portions. The other contender for “inventor” of the Mission-style burrito is El Faro, which sold its first burrito in 1961 to a group of San Francisco firefighters. Their super burritos are made of fresh tortillas bursting with heavy helpings of rice, beans, meat, and cheese, but in recent years it's their breakfast burritos—including one with chorizo and scrambled eggs—that have really gained traction.